Petrex, the Aberdeen based Subsea Engineering and Project Management Consultancy, have been showing their commitment to the community and local education. 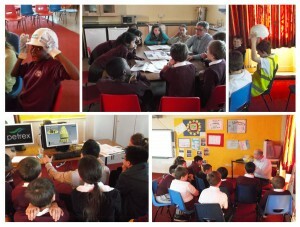 Last month saw ‘The Petrex Education Meets Enterprise Initiative’ arrive at Skene Square School. Recently we heard Youth Employment Minister Angela Constance stressing that the Government wants deeper and more comprehensive engagement between the world of education and the world of work. We also constantly hear of the North Easts’ on going skills shortage in the Oil & Gas arena, due to a lack of understanding and poor early intervention with information available to schools. Petrex: a proactive forward thinking company decided to start their own local project. The Petrex Education Meets Enterprise Team, Kevin, Derek and Ian were given a warm welcome by pupils and teachers alike discussing recent achievements and events at the school following on from Skene Square School celebrating its’ recent 150th birthday. Petrex introductions over, there then followed a day of informative presentations and interactive group sessions to senior school pupils sharing a general awareness of The Oil, Gas and Renewables Industry. Eileen Jessamine, Head Teacher at Skene Square was over the moon with the results and previous discussions with Petrex made sure that the days content also supported the schools current Curriculum for Excellence. Finally, a Design Challenge was put to the Skene Square Seniors as they were asked to design how they would see the Subsea Field Development in the year 2050! This will form part of their term work, and once completed the schools panel of judges will sit with the Petrex team to find the ultimate winner and award very apt industry related prizes. Petrex, established in 2008 is a privately owned Subsea Engineering and Project Management Consultancy actively working in the International Oil, Gas and Renewables Industry.